This school was founded by the Freedmen’s Bureau shortly after the Civil War to educate freedmen, women, and children. In 1868, Martha Schofield, a Quaker from Pennsylvania, came to Aiken and began her long career as superintendent. The school soon expanded to this two-block site and offered instruction in industrial, farming, and homemaking skills. Schofield School educated more than 6,000 students by 1898. In 1940 alumnus Sanford P. Bradby became its first African American superintendent. 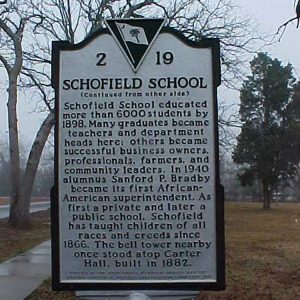 At first a private and later a public school, Schofield has taught children of all races and creeds since 1866.